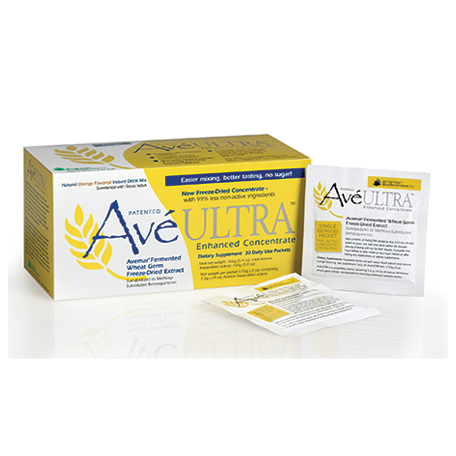 AvéULTRA is a dietary supplement containing fermented wheat germ extract (FWGE). This astounding natural compound has been the subject of more than 100 studies and 20 peer-reviewed medical publications describing in vitro, in vivo, and human clinical trials. The results of these studies examining wheat germ benefits have been so dramatic, that it’s hard to believe that FWGE is an all natural substance. One of the most extensively researched products in the natural products industry, this powerful dietary supplement health drink has been scientifically proven to work in several ways to support the immune system. The ingredient FWGE, marketed under the trade name of AvéULTRA, is delivered in the form of a concentrated health drink. Each pre-measured, individual-use packet contains 5.5 grams of fermented wheat germ extract freeze-dried actives and can be mixed with 4 oz. of cold water or juice. Increases the immune system’s ability to identify harmful cells for destruction. Regulates glucose metabolism at the cellular level, starving enemy cells that require excessive glucose. Promotes optimal NK-cell targeting ability and the coordinated response of white blood cells: macrophages, B-cells, T-cells and NK-cells. Regulates and modulates the immune system’s white blood cells for peak performance. Enhances the ability of T-cells to respond to antigen presentation. Maintains healthy cellular and humoral (Th1/Th2) immune balance. Enhances the ability of B-cells to respond to activation and produce appropriate antibodies. 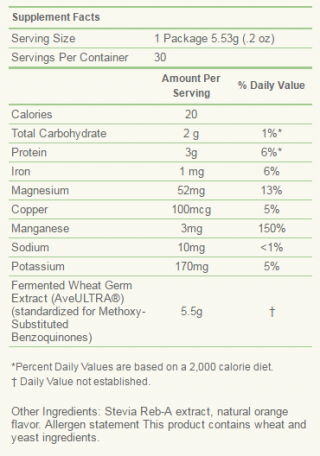 As a dietary supplement for adults, use one (1) AvéULTRA packet (5.53g, providing 5.5g Avemar fermented wheat germ actives) per day. Add contents of AvéULTRA packet to four (4) oz (120 ml) of cold water or juice, mix well and drink within 30 minutes (mix by shaking with ice for best results). To maximize absorption, consume AvéULTRA approximately one (1) hour before or after food, and two (2) hours before or after taking any drugs or other dietary supplements. My wife and daughters take Ave Ultra and love it. Click here for research on fermented wheat germ extract.